Play it slowly is a software to play back audio files at a different speed or pitch. It does also allow you to loop over a certain part of a file. It's intended to help you learn or transcribe songs. It can also play videos thanks to gstreamer. 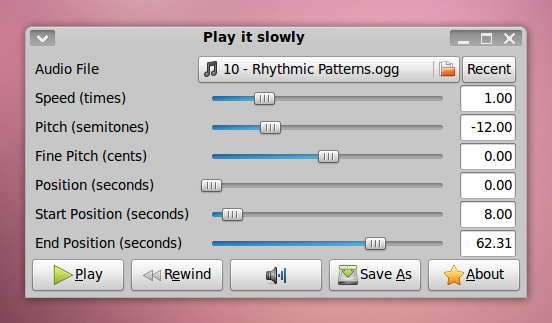 Play it slowly is intended to be used on a GNU/Linux system like Ubuntu. Download deb packge from here once you have deb package you can install by double clicking on it.